It is Open Farm Sunday this coming Sunday (9 June) and as I mentioned in an earlier post, we’re looking forward to spending the day at Wookey Farm, meeting the goats, enjoying tractor rides and wanging a few wellies! In the run up to Open Farm Sunday, many of the initiative’s sponsors have created recipes to celebrate British farming by showcasing British produce. I was invited to try out this warm pea and chilli salad, courtesy of Asda magazine. 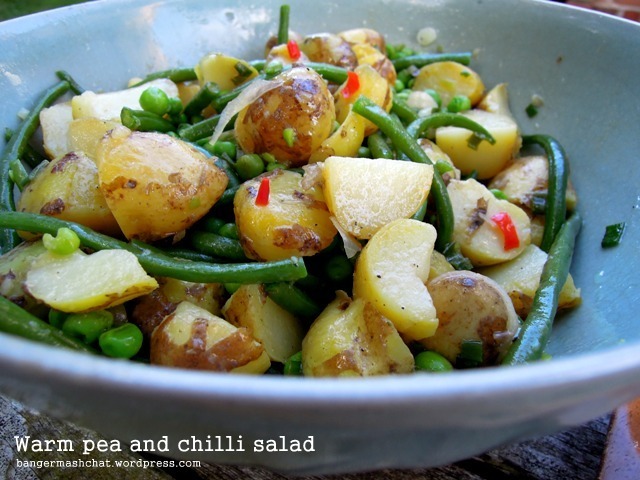 It’s a lovely summery dish, also featuring new potatoes, spring onions and green beans in a tasty mustard dressing. We ate ours with some simple chicken satay, but it would be equally good on its own with some crusty bread to mop up the dressing, or as an accompaniment for a barbecue. Boil the new potatoes until just tender, then drain. When cool enough to handle, halve or quarter them, depending on size. Put in a bowl. Add the peas and beans to the pan with enough boiling water to just cover them. Bring back to the boil and simmer covered, for 4 minutes. Drain and add to the potatoes. Heat 1tbsp oil and cook the spring onions and chillies over a low heat for 2 minutes. Remove from the heat. Add the rest of the oil, the vinegar, honey and mustard. Season. 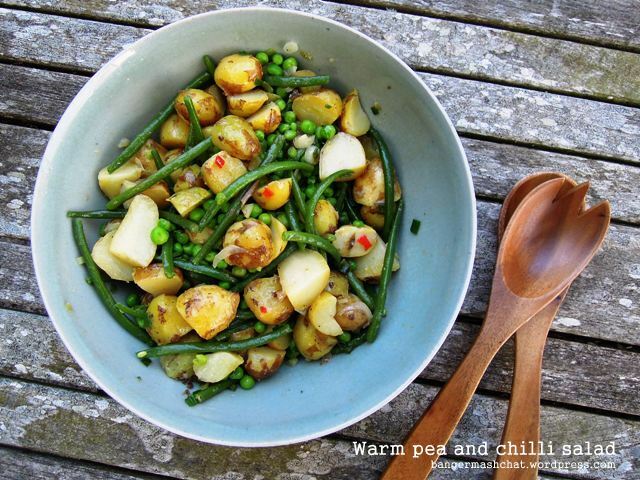 Add the warm dressing to the potatoes, peas and green beans and toss together before serving. The eighth annual Open Farm Sunday on 9 June 2013 provides a great opportunity for the public to truly get to know how their food is produced and how the countryside around them is cared for. that looks lovely – I love potato salads like that. Looks very lovely. Now I want my beans, peas and potatoes to get a move on in the garden so I can try this. Thanks Deena! Haven’t tried it with cheese but good idea. Maybe a little crumbled blue cheese or a tangy feta or goat’s cheese?